Converting light to electrical energy in solar cells depends sensitively on nanometer-scale structures. This group reports the first successful solar cell made from an ordered bicontinuous gyroid semiconducting network. 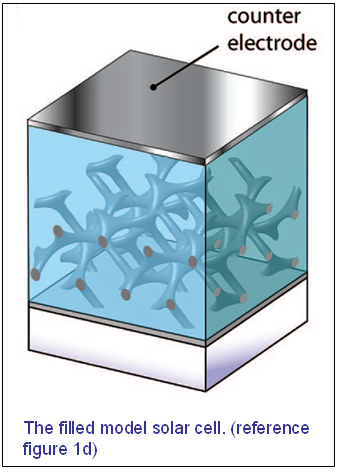 The freestanding gyroid network is fabricated by electrochemical deposition into the 10 nm wide voided channels of a self-assembled, selectively degradable block copolymer film. The highly ordered pore structure is filled with an organic hole transporting material. The first such exhibited a promising 1.7% power conversion efficiency. The solid-state dye-sensitized solar cell (SDSC) is one of the most promising nanotechnology-based hybrid photovoltaic systems and has sparked widespread interest in fabricating mesoscopic semiconductor materials with very large internal surface areas. 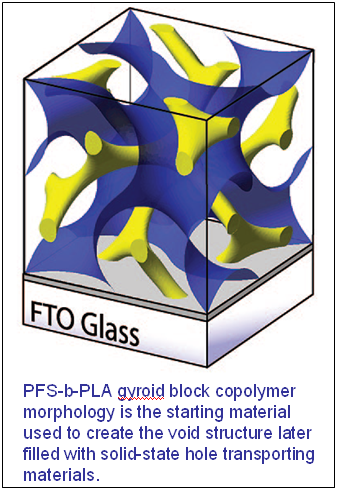 This group used the self-assembled gyroid polymer phase to create a three-dimensional structure that could be filled with electrical donors and acceptors. Their prototypical thin film solar cell showed a light collecting efficiency up to 1-2%. These materials may be able to compete favorably with more expensive silicon-based cell technologies. Edward J. W. Crossland, Marleen Kamperman, Mihaela Nedelcu, Caterina Ducati, Ulrich Wiesner, Detlef -M. Smilgies, Gilman E. S. Toombes, Marc A. Hillmyer, Sabine Ludwigs, Ullrich Steiner, and Henry J. Snaith, “A Bicontinuous Double Gyroid Hybrid Solar Cell,” Nano Lett. 9 (8), pp 2807–2812, 2009.